Monday, Monday, can’t trust that day. Not so far as secondhand bookshops being open, anyway. But we should be all right making for the border, to the town of books. Except by now they’re getting wise to us. Beyond Hereford, they’ve closed off the road. And a roulette of minor roads nearby. They don’t even make a pretence of it, there’s no sign of work, not a fluorescent vest in sight. No warnings given, no diversions, just no way through to Hay-on-Wye. Luckily we’ve come prepared. There’s a truckers’ road atlas on the back seat. Asterisks for sleazy caffs, shading for shady fuel depots, warning signs where the Ministry of Transport wardens lurk. Full of illicit side roads, short cuts up doubtful tracks, concealed entrances into No Man’s Land. The keen bookman alongside, Mr Howard, is soon on the case, and we’re plunging through Machenesque high-hedged lanes, narrow and full of blind corners. An old timber tollhouse lets us into unknown terrain. It looks like it’s still collecting something from you, but it’s not clear what. You might find out years from now. New ‘road closed’ signs begin to spring up on all sides. They know we’re out there, but they’re not sure where. And surely, surely, they reason, no-one would go past the toll-house. No-one. So we’re staying just ahead, and get to Hay the long way, claiming sanctuary in the enclave of the car park at the Old Cinema Bookshop. Phew. Not much they can do now we’re in Hay. It’s an outpost of Inner Bohemia. Risky to offend the Kingdom. They’re radical in Radnor. An independent lot. The metal boxes outside the entrance have their lids open, and the dampest, shabbiest, obscurest books are looking for new owners, like sad-eyed abandoned pets in the animal shelter. £1 each, no questions asked. We offer shelf-room to a few, trusting this might appease the inscrutable god of the toll house. Inside, the shop is so vast that there are browsers that have never escaped, or maybe never wanted to. In tattered robes, with sickle nails, and with hair to the knees, they make Ben Gunn look like a Carnaby Street dandy. They’re still staring at the forty foot long shelf labelled General Literature JA-JE. Been at that nineteen days already. The ones that get too dessicated, it’s rumoured, are taken away at night and pounded down for book pulp, come back here in a different form. It’s what they would have wanted. Don’t touch the recent bestsellers, the word is. But we’ve been here before, and know the score. Whatever you do, don’t read any titles. Just let your gaze skim swiftly. Subliminal browsing, that’s the trick. The shadows move, and there’s a book by Rex Warner. The most dangerous man in the South West, the papers called him. As wing three-quarter for Gloucestershire, admittedly. Deft in bars at darts and shove ha’penny too. Destined for a career as an Oxford philosophy don until “he saw the Absolute walk in at his door” (said Cecil Day-Lewis) and had a breakdown. His The Wild Goose Chase (1937) is about characters who set off from a small-town to travel beyond “the frontier” in search of the eponymous bird, a symbol of freedom. We should have read it before we started. With The Aerodrome (1941) he came to be called the English Kafka. The sprawling, spasmodic and often sordid goings-on in “the Village” are contrasted with the order and efficiency of an air-base established nearby, ruled by a ruthless and visionary Air Vice-Marshal. Chillingly acute on the lure of authoritarianism, frank about the frequent shabbiness and imperfection of its liberal alternatives. Other solemn novels followed, a book on cricket, a meditation on the Cult of Power, translations from the Greek. But this is a later, lighter work. Escapade, A Tale of Average. The Bodley Head, 1953. In jolly dustwrapper by Osbert Lancaster. “It has been written especially for the enjoyment and entertainment of the reader—and for no serious reason. No lesson is expected to be drawn.” Hmmm, maybe. One Summer’s day in an English village that might be anywhere. Cricket. A Pageant. A Dotty Old Lady Distributing Patriotic Pamphlets. A Colonel whose Butler is a Philosopher. A Canon Vexed by the Shakespeare Authorship Question. A Gardener quoting Doubtful Folklore about Birds and Flowers. The shades of E F Benson, Lord Berners, Ronald Firbank gliding through the plot. And a Rumbustious Finish. Splendid stuff. A Frolic, a Fancy, a Whimsy. And Yet. Later on, in an undisclosed location in the town, Mr Howard finds a cache of obscure British B-movie Science Fiction paperbacks. There’s one about a super-computer that directs all activities across the country, even the most trivial, and always, as it sees it, for the best. It’s Warner crossed with Orwell. People think they are making free choices, but they aren’t. An Advanced Intelligence directing the affairs of England. What a bizarre fantasy. In 1981, as a young editor at The Washington Post Book World, I tracked Rex Warner to the assisted living facility where he was then living and asked him to review Gore Vidal's "Creation." He agreed and did a fine job. A few years later, I spent an evening with Vidal--not That kind of evening--and he told me of his surprise, and pleasure, that Warner was still alive to review his book. 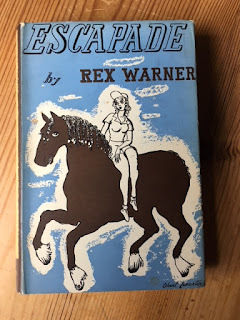 Being a devotee of Firbank, Berners and Benson, I must keep a weather eye out for "Escapade." I've got "The Aerodrome" and "The Wild Goose Chase," as well as those Penguin translations which made me think Warner would be a good reviewer for Vidal's novel about antiquity. Thank you, Mark, for another delightful Wormwoodiana column. Thank you, Michael. I do think Rex Warner is a bit under-rated now, having once been over-feted. And his humanistic "message" books are still highly relevant today.